28-May-2018: A research team led by physicists at the Technical University of Munich (TUM) has developed molecular nanoswitches that can be toggled between two structurally different states using an applied voltage. They can serve as the basis for a pioneering class of devices that could replace silicon-based components with organic molecules. The development of new electronic technologies drives the incessant reduction of functional component sizes. In the context of an international collaborative effort, a team of physicists at the Technical University of Munich has succeeded to use single molecules as switching elements for light signals. The team initially developed a method that allowed them to create precise electrical contacts with molecules in strong optical fields and to address them using an applied voltage. At a potential difference of around one volt, the molecule changes its structure: It becomes flat, conductive and scatters light. This optical behavior, which strongly depends on the structure of the molecule, is quite exciting for the researchers because the scattering activity – Raman scattering, in this case – can be both observed and, at the same time, switched on and off via an applied voltage. 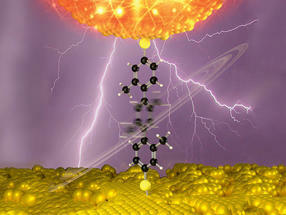 The researchers used molecules synthesized by a team based in Basel and Karlsruhe. The molecules change their structure in a specific way when they get charged. They are arranged on a metal surface and contacted using the corner of a glass fragment with a very thin metal coating as a tip. Establishing reliable electric contacts between individual molecules is extremely challenging from a technical point of view. The scientists have now successfully combined this procedure with single-molecule spectroscopy, allowing them to observe even the smallest structural changes in molecules with great precision. One goal of molecular electronics is to develop novel devices that can replace traditional silicon-based components using integrated and directly addressable molecules. Thanks to its tiny dimensions, this nanosystem is suitable for applications in optoelectronics, in which light needs to be switched by an electrical potential.